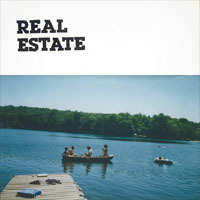 First Look: Real Estate – 'Out of Tune' 7"
Real Estate’s Out of Tune 7″ offers higher fidelity than its precessors and melodies as familiar as a best friend. As good as the band’s debut album was (really good! ), this is even better, the band’s tuneful guitar meanderings soaking across the rhythm section’s sturdy canvases like Cezanne watercolors. “Out of Tune” and b-side “Reservoir #3” are brisk but beautiful, urgent without sinking into desperation — eight minutes of bitter and sweet married on a windy beach.